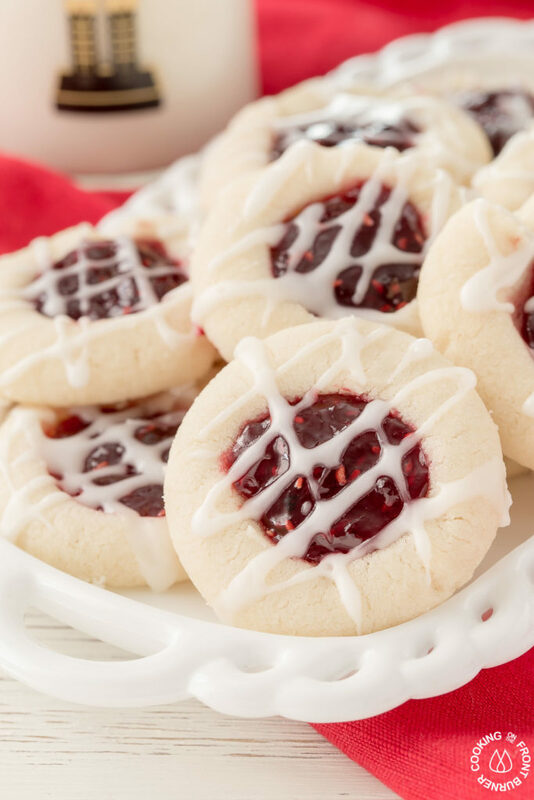 Your holiday cookie plate won’t be complete unless you have these easy Raspberry Thumbprint Cookies with buttery shortbread, almond flavoring and glaze. They look festive too! Thanksgiving is just around the corner and by now I’m sure you have your menu set, right? 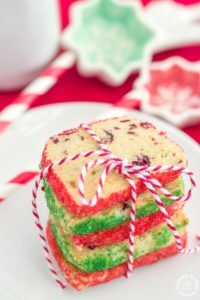 Well, once that day is over, it is time to think about what you are making for Christmas and one of the best things are cookies. Do you agree? Do you have any family favorites? We have a couple which I’ll mention later but I’m always on the lookout for some new ones to try. 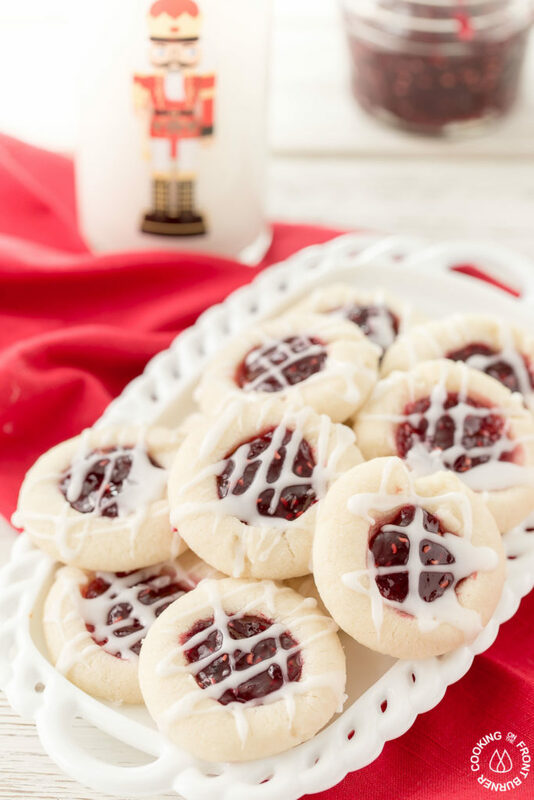 I first saw this recipe over at the Land O Lakes website and since then, well, I have seen them all over town! 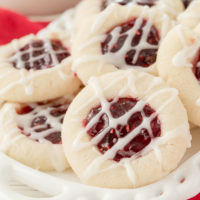 I guess I’m not the only one who loves raspberry thumbprint cookies. I think you will too. 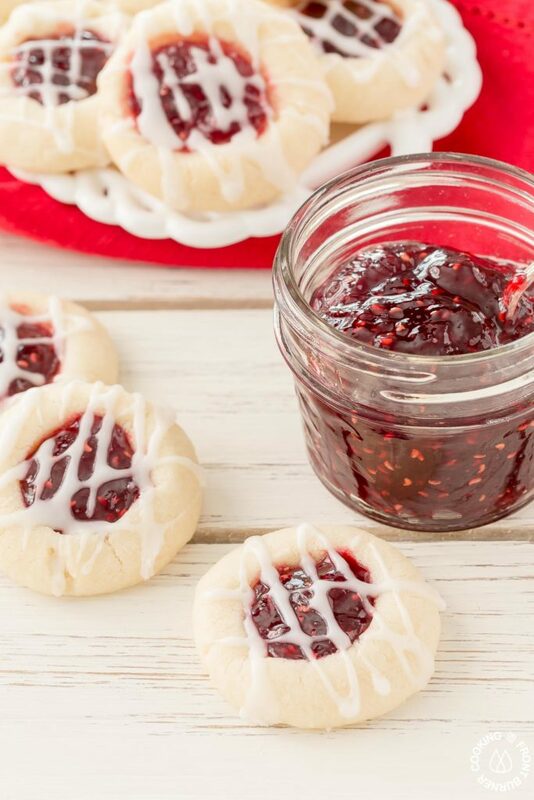 The cookie part is buttery with a hint of almond, topped with sweet raspberry jam and drizzled with an almond glaze. It is really important to follow the recipe exactly as stated using Land O Lakes butter. I read on a few other blogs that some folks did not have good luck so go with the tried and true recipe that follows below with that butter. 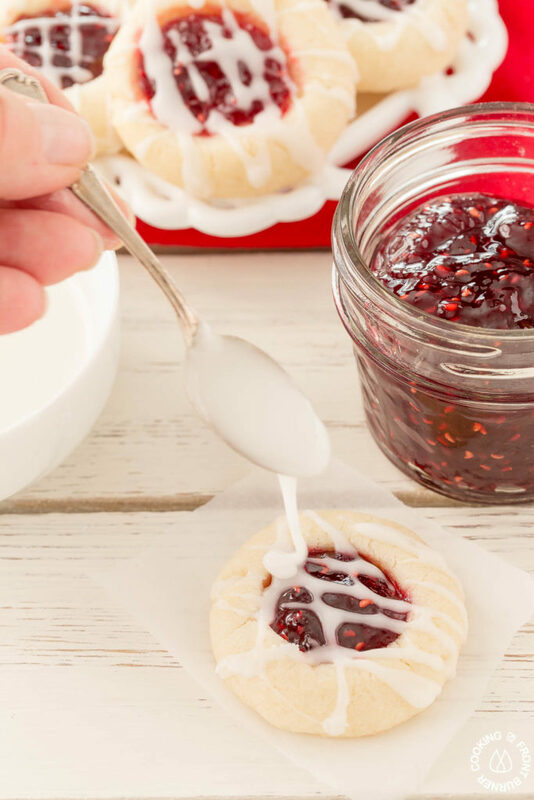 One substitution you could make is if you aren’t a fan of almond extract, is using vanilla and a different kind of jam would be fine too. It’s just the butter you need to keep the same. As I mentioned, we do have some family favorites. My son-in-law really loves these Triple Ginger Cookies as they do have 3 different kinds of ginger to give them a little bit of a bite and they have chunks of chocolate. 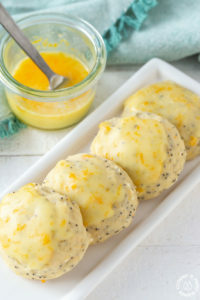 They are soooo good and also easy to make. If I leave a plate out, they disappear quick! We also love these Italian Black Pepper cookies. 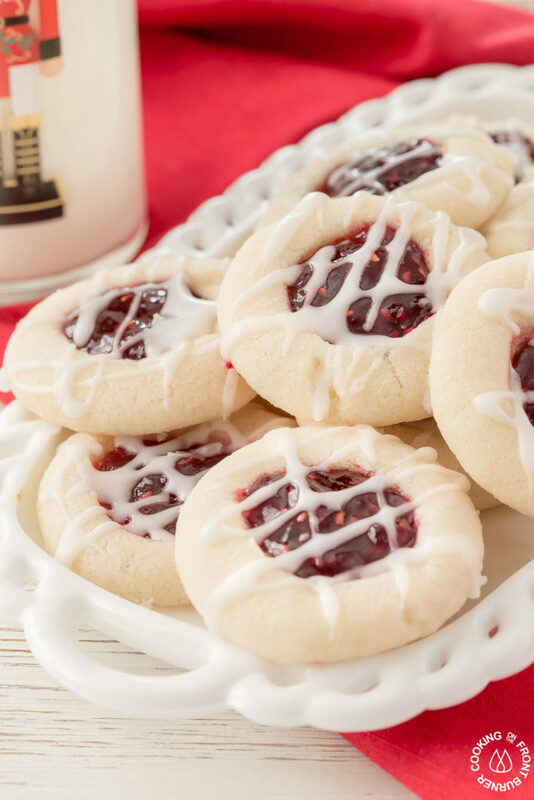 They are a blast from my past and always on our cookie tray and happen to be a favorite of my husband. It’s a cherished recipe from my Italian grandmother. So now you have a few new cookies to try! Keep calm and get baking, you have a little over a month before Christmas! 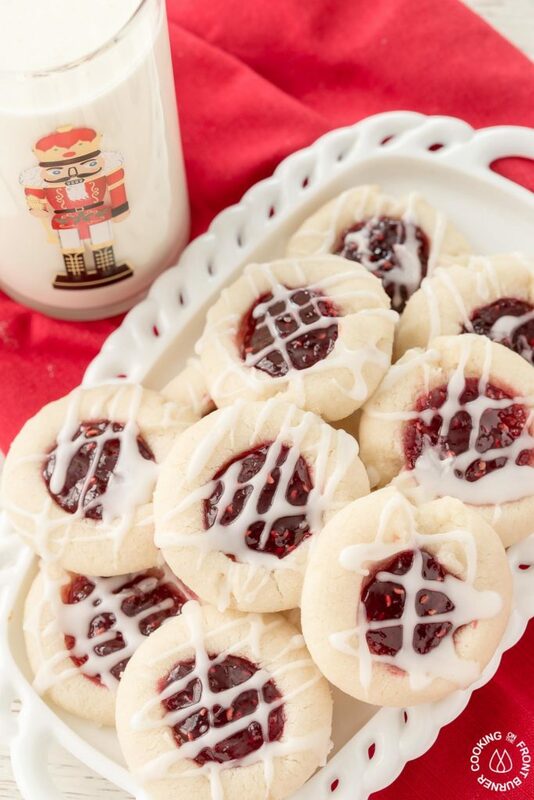 These Raspberry Thumbprint cookies are delicious and festive for the holidays! In a mixing bowl, combine the butter, sugar and 1/2 teaspoon almond extract. Bake for 14-18 minutes until edges are lightly brown. I did find when I used my thumb, the cookies spread too much so I used the back of a 1/4 teaspoon to make the indentation. Oh my goodness these look incredible! 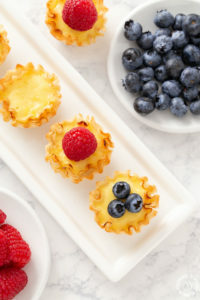 I cannot wait to try baking these!! We really liked them… I’ll be making another batch soon! Happy baking! Good Afternoon Deb, I love raspberry jam, I love almonds so I think these lovely Raspberry Thumbprint Cookies will ‘hit the mark’ for me. I have printed the recipe and I look forward to making these cookies. I hope you will give them a try! Thanks for stopping by! 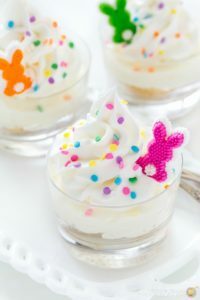 Hello I’m going to make these tomorrow. 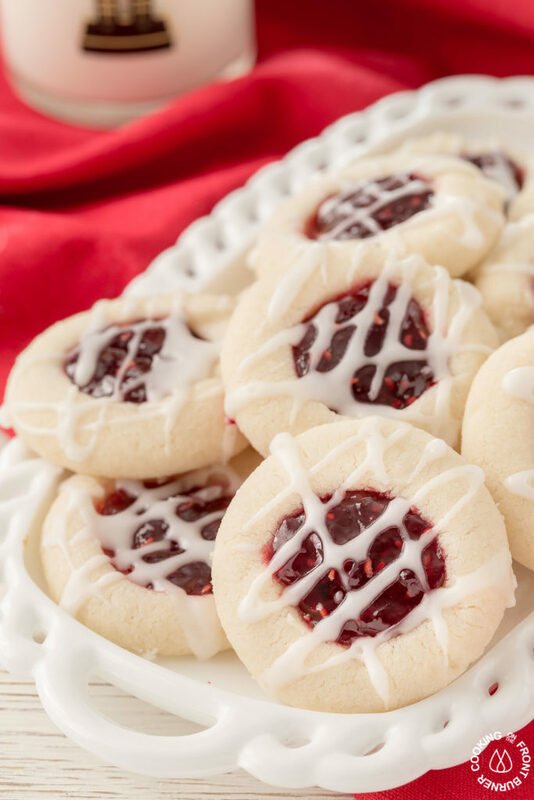 Can you tell me how you got the glaze to look so perfect on the top of the cookies? Did you use a knife to drizzle the glaze. Whenever I try to make a glaze look pretty and uniform, it comes out sloppy. Yours looks beautiful and professional! Hi, I made the glaze a bit on the thin side and used a small spoon to drizzle. wow! It looks yummy! can not wait to try it out! I am putting these on my to-do list.